This blog post is in partnership with the Seafood Nutrition Partnership but all opinions are my own and I appreciate your support! Rewind to ten years ago and you would not catch me eating seafood. I did not know much about it, and the fear of giving it a shot kept me away from it for far too long! Perhaps you’ve had a similar experience when it comes to seafood or another food? Isn’t it funny how you can go onto like something so much after thinking you’d never eat it for so long? As my taste buds evolved, I dabbled in salmon and tuna on salads, which was a great place to start because it increased my confidence in trying other types of fish. Many fish tacos followed, and now I love exploring different ways to season and cook it and feel good knowing how beneficial it is to my health. One of my favorite seafood recipes (and most popular!) on this blog is for turmeric salmon oatcakes —they are easy to make and versatile on top of other foods! I also really enjoy incorporating seafood into my diet at least twice a week for the variety and the simply because meat can get super boring! Something as simple as seasoning canned salmon and pairing it with crackers for a quick lunch, makes it easy to reap the nutritional benefits. It’s also a really cost effective source of protein that is shelf-stable meaning you can stock up when you see a sale! It’s also worth mentioning that cooking seafood does not have to take a long time or be super fancy like it might seem. Once you’ve found one way to cook it, explore another and incorporate ingredients and flavors of the season! 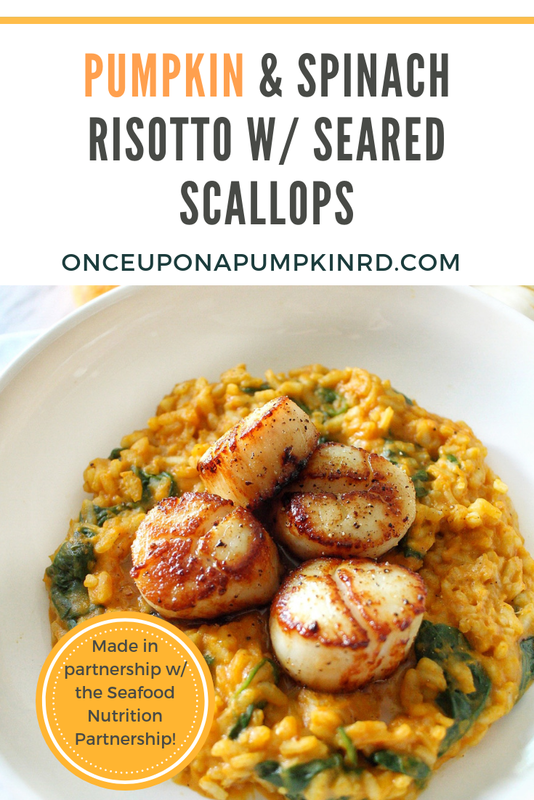 This recipe for pumpkin & spinach risotto with scallops only looks fancy when plated, but it’s really not hard to make at all and perfect for the colder weather! The American Heart, Diabetes, Pediatric, Alzheimer’s and Psychiatric associations–and many others–promote seafood as part of the solution to be healthier, recommending fish and shellfish as least twice a week. This recommendation which translates to about 250 mg of omega-3s EPA and DHA per day, is based on decades of research that shows seafood at least twice a week can lead to fewer instances of chronic and preventable diseases, and even reduce the risk of death from any health-related cause by 17%. It’s been found that adults who eat seafood regularly have better memory and live an average of 2.2 years longer. How do you know if a fish is fresh? If it’s a whole fish fillet the flesh of the fish should be firm and elastic, meaning it will spring back when touched. But what about mercury? For men and women not trying to get pregnant, the recommendation is to eat a variety of seafood each week to reap the nutritional benefits. Pregnant women should avoid shark, swordfish, king mackerel, tilefish, bigeye tuna (does not include canned tuna), marlin and orange roughy because they are higher in mercury. Seafood also contains selenium, which is needed for our brain and nervous system to function. The mineral protects us from mercury by binding to it. Which fish has the most health benefits? All fish are great high-quality protein options, but some are packed with higher amounts of omega-3 fatty acids which gives them more heart, brain, eye and overall health benefits. These fish are mackerel, trout, salmon, sardines, anchovies, and pollock. Some shellfish are also high in omega-3s like oysters, crab and mussels. Is farmed safe to eat? Both farmed and wild seafood are safe to eat. When it comes to the environment, both farmed and wild fish and shellfish can be harvested responsibly. If a recipe calls for white fish what does that mean? White fish is a mild-flavored fish, so if your recipe calls for it look for cod, bass, flounder, grouper, haddock, snapper or tilapia. These are great for pan-frying, and pan-searing. What does it mean to be sustainable? Sustainable means that the seafood has been caught or farmed with minimal impact on the environment. This fall I challenge you to incorporate more seafood into your diet and join me in taking the #Seafood2xWk pledge. It means you recognize seafood is a healthy choice for you and your family and is one of the leanest proteins with a variety of nutrients beneficial to heart and brain health! I fully intend to get more creative in the kitchen with seafood and I hope you will too! Scallops may seem super fancy to make, or maybe you thought they were unhealthy because at restaurants they are often in heavy pasta dishes. 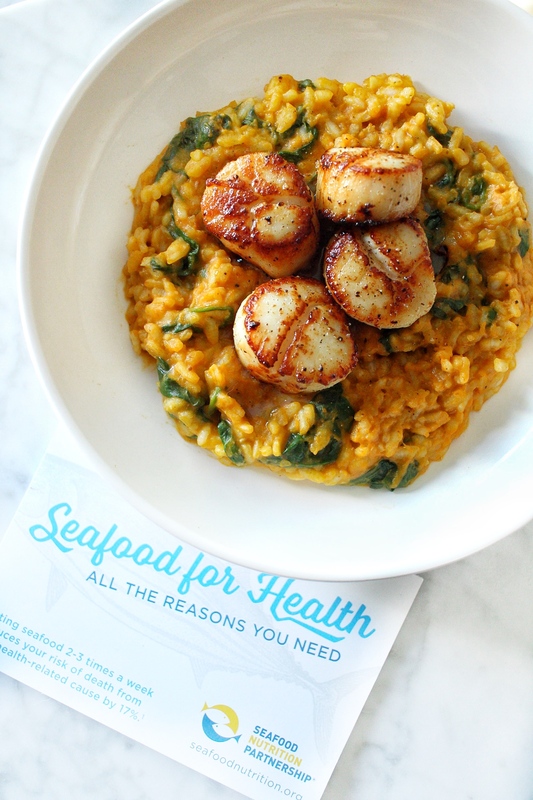 Put a seasonal spin on a classic dish with this recipe for pumpkin & spinach risotto with scallops. It’s the perfect cozy date night in dish and pairs well with a crisp, fruity wine like a sauvignon blanc. In a medium-size heavy saucepan, heat the olive oil over medium-high heat. Add the onion and garlic and saute, stirring continuously, just until softened, 3 to 4 minutes. Add the rice and continue to stir, using a wooden spoon, to coat the rice with the oil. Add the white wine and continue cooking, stirring often, until it has been absorbed by the rice. Pour in enough stock to cover the rice completely, about 3 cups, and continue to cook, stirring often, until all the liquid is absorbed. Pour in 1 cup more of the remaining stock and stir and cook until it has been absorbed. Stirring, until the rice is tender but still chewy, and most of the liquid has been absorbed. Meanwhile, place scallops on rimmed baking sheet lined with paper towel. Place another paper towel on top of scallops and press gently on towel to blot liquid. Let scallops sit at room temperature for 10 minutes while towels absorb moisture. Stir in the pumpkin puree, and spinach into the risotto and reduce the heat to very low so that the rice doesn’t simmer anymore. Stir in the Parmesan, ginger, and butter to give the risotto a nice, creamy finish. Top with salt and pepper to taste. Add salt and pepper to both side side of scallops. Heat 1 tablespoon oil in a nonstick skillet over high heat until hot. Add scallops in a single layer, flat side down, and cook, without moving, until well browned, 1 1/2 to 2 minutes. Add 1 tablespoon butter to skillet. Using tongs, flip scallops and continue to cook, until sides of scallops are firm and centers are opaque, about 30 to 90 seconds longer. Add ½ of risotto to a plate, top with 2-3 scallops per portion. Sprinkle more cheese on top if you wish, and enjoy! Done scallops with turn white or opaque and become firm to the touch when done. Seafood should be consumed within one or two days when it’s fresh or thawed. Swap white wine for more broth if you desire. 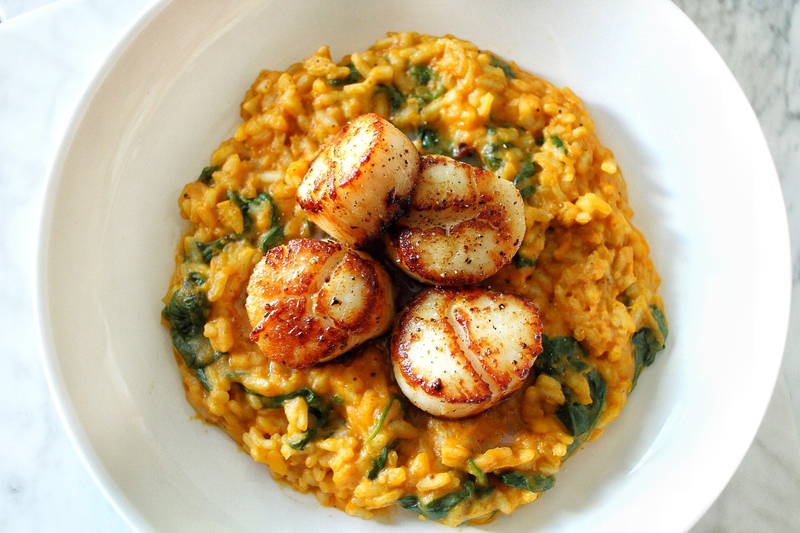 Pin this recipe for pumpkin & spinach risotto with seared scallops!